What is everyone up to this weekend? I only have my apartment for a few more days and my fiancé only has his house for a few more days so we are in the last home stretch of moving! Movers officially come on Monday and by then, I should be almost fully DONE! I've had a few things delivered and I cannot wait to get things hung on the wall so it starts to feel like a home! Tomorrow is Easter and we typically go to church and then my parents always host Easter and my extended family comes! It's lots of fun and lots of good food. I've found a ton of good things this week- all over the place, but worth the browse!! With Easter this Sunday, I thought it would be fun to share what I would want in my Easter basket if the Easter bunny was feeling very generous, ha! My parents actually gave me a basket up until about 26... I miss the baskets but I'm making one for Henry so that's still fun! One of the products that I wanted to highlight is this peachy-pink concealer. When I was in Jamaica for the Draper James shoot, we had a makeup artist and she recommended using a peachy-hued concealer. I don't usually have dark circles, but within the past month with so much going on, my circles have been DARK! She said that the peachy pink color will help to neutralize the blue/purple tones in under eye circles and then you can add your own concealer over top. She did it on me and it totally erased any trace of dark circles. I haven't ordered this product yet, but it's the next thing I'll be buying! Oh my goodness, what a whirlwind of an April so far. This entire month has sped by and I have been the busiest I have ever been. Hence why I missed a post this week, which, in the 10 years of Summer Wind is a big rarity. That is when you know things are REALLY crazy. Today I am spending all day working from the new house because I have some furniture being delivered and Comcast will come to set up cable/wifi and I'm so excited! We were planning on spending our first night at the new house on Friday but I just could not take my bare, sad-looking apartment any longer, so we had our first night last night. I actually felt like I was staying at a hotel because my bed was SO comfortable, ha!! The first night made it all feel so real and I'm just so excited for all that is to come! I will finally have all of my furniture delivered on Monday. Crazy. It's been so weird to watch my apartment become bare and the new house starting to look so homey. Now, I cannot wait to close the door to my apartment and not have to deal with it any longer, ha! I had my inaugural Costco trip this week and I'm obsessed. They have so much good stuff and the fact that I actually have a place to store more than a few rolls of toilet paper is such a luxury to me. It's the little things, right? 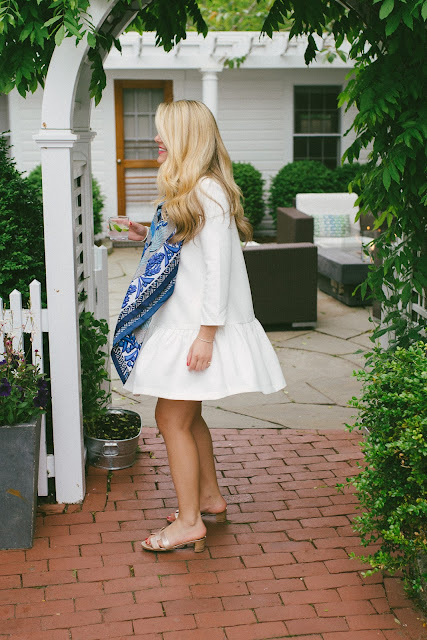 Wearing: You saw the second photo already this week but I wanted to share a second photo of how you can wear this white dress in two very similar ways, but one is for cooler spring weather and the other is for summer weather! The dress is not see through so I do not wear a slip underneath and it runs true to size. I could not recommend it more! Eating: This recipe for french onion chicken meatballs sounds phenomenal! I'm a huge fan of French onion soup so this is right up my alley. Reading: Have you seen this coffee and cream chart? It's too funny! I'm definitely an f-6... what are you? Sale-ing: Ralph Lauren is having a 30% off sale, use code FAMILY. Love these jeans, this color blocked puffer, I have this incredible cashmere cable cardigan. Also, my favorite cable cashmere sweaters are included in the sale. It's a rarity that they go on sale! My other tip is that if you wear a size small in women's clothing, usually a size Large or XL in boys will work so you can snag this cashmere cable sweater for a lot less! Watching: The Big Little Lies season 2 trailer is out now. I cannot wait! Loving: I just got this gorgeous blue and white maxi dress in the mail and I am so in love. I cannot wait to wear it! Wanting: Does anyone have this iPhone case? I think I want to get it for my iPhone XS Max! On a completely unrelated note, I love love love hot dogs. I don't eat them that often because they are bad for you, however, these sauces are making me very excited for grilling hot dogs this summer... I'm just excited to have a grill, ha! Trader Joe's uncured organic grass-fed beef hot dogs are my absolute favorite- they are so flavorful. Pittsburgh-ing: Did you see the dates for the Arts fest have been announced? So excited- one of my favorite things about summer in Pittsburgh! Traveling: I mentioned this in Monday's post but we have a quick weekend getaway to Ohio wine country planned which will be fun and then we booked a Nantucket trip in June for my fiancé's 30th birthday! Quoting: 'Our greatest glory is not in never falling, but in rising every time we fall.' - Confucius // See more of my favorites, here. Today's post is a highly requested one! I know many of you are also brides-to-be and are looking for special white dresses to wear for all things wedding! I have always been a fan of white dresses and especially in the summer months. Luckily, right now you can find a lot of white dresses. I think if you are getting married later this year or early 2020, now is a good time to start looking because right now through about September are when white dresses are available in abundance! Today I wanted to share some of my favorites! I'm including a lot of different brands as well as price points! Today I thought I would do a bit of a diary-style post where I share some updates with all of you. I feel like SO much has been going on over here in the past few weeks and it has been a lot! Jamaica// Last week, I had an incredibly exciting trip with Draper James (Reese Witherspoon's brand). We traveled to the incredible Tryall Club in Jamaica with a team of photographers, art directors, hair and makeup artists, the DJ team and more! Me and three other influencers wore pieces from the May/June collections and these images will be a part of the campaigns. It was such a pinch-me-moment and I cannot wait to share more about the trip and the collections! Wedding Dress// This weekend, I had two bridal appointments and I FOUND MY DRESS! I am not sharing any details about it but I am just so excited. It was so much fun to spend the day with my mom, dad, grammie, and fiance´s mom. We also went to lunch at our rehearsal dinner spot so my fiance´ and his mom could try the food and see what they thought about the space. I'm so glad they loved it because it is one of my favorite local spots where the food is so delicious. Their antipasto platter is out of this world incredible and a lot of the ingredients used in the dishes are imported from Italy! Moving// I am sooooo over moving. I really shouldn't complain because most has gone smoothly thus far. However, I'm just over it. I'm kind of living in limbo right now because most of my belongings are in the new house but all of the furniture is still in my apartment, so it's like I'm living in two places. I think our first night in the new house will be this Friday, but that's TBD! Today, my mom is actually helping me move the rest of my stuff. So, I hope by the end of today, very little of my 'stuff' will be in my apartment and all that will be left will be the furniture for the movers to take care of. I've ordered some new furniture, new tech things like TV's, ring doorbell, Amazon Show, etc. that I'm excited to set up. The only frustrating thing is that I really want to start hanging things on the wall but obviously have to wait until all of the furniture is in to start making the house into a home. I seriously cannot wait. Traveling// I really tried to keep traveling to a minimum for the first 6 months of 2019. Between the engagement and wedding planning, plus the new house and move, I just felt like adding too much travel into the mix would overwhelm me. We are going on a fun wine trip to Ohio (my fiancé is from Ohio) and I'm looking forward to just getting away for one night. Then, we are looking forward to our Nantucket trip in June. We went to Nantucket for the first time together last year and we had a blast. It's truly my fiance´s happy place and we are going for my fiance´s 30th birthday! My fiance´ used to work summers on Nantucket (at the Juice Bar!!) when he was in college and one of his best friends from high school/college also worked at the Juice Bar with him. They lived together on Nantucket... it was so sweet, Andrew and I rode bikes to his old house on Nantucket last year. So, his best friend and his fiance´ will be joining us for the long weekend celebration and I'm so excited! Starting in July, travel picks up and continues to be busy for the rest of the year. Fun!! My Birthday// My 29th birthday was yesterday. I know I'm getting old because all I requested was my mom make a homemade meal for me (which she already does so often, ha!) and that I get my absolute favorite Giant Eagle white cake with white icing. One of my all-time favorite foods that I don't eat often because it's hard to find (and my mom rarely makes) is corned beef and cabbage. Probably not most people's favorite food, but it's truly one of my all-time favorite meals. So, Saturday night, we went out for drinks and my favorite Mexican and then Sunday my parents had corned beef and cabbage for me...yum! Afterward, more family came over to celebrate with cake and ice cream! One of the other things I wanted to do for my birthday was go antiquing- which is really how I know I am getting old, ha! So my mom and I spend Sunday afternoon looking for antiques for my new house. Unfortunately, we struck out but it was so much fun. Happy weekend, everyone! I just got home from Jamaica which was amazing. Today, we are going dress shopping! I have two appointments at places in Pittsburgh which will be so much fun. In between the two appointments, we are having lunch at what will likely be our rehearsal dinner spot. Then, this evening, my fiance´is taking me out for my birthday dinner!! Tomorrow is my birthday! Between returning from Jamaica, wedding planning, and moving, I feel like I haven't had a second of downtime. So, I requested a home cooked meal at my parent's house and then my mom is hosting a small family get together for cake after dinner. Exactly what I wanted. low key! I have found so many cute things in the past few days. After being in Jamaica and being reminded of what summer feels like, I felt excited for all of the spring/summer clothing, shoes, accessories. I'm also really excited about the weather here in Pittsburgh. April is usually such a toss up and right now the weather has been so mild, and dare I say, WARM! Just a sale FYI that Bloomingdale's Friends and Family sale (take 25% off) ends tomorrow! This evening, I return home from Jamaica! It's been so much fun and I can't wait to share more with you in blog posts to come! What a dream. This weekend, I am so excited because I have two wedding dress appointments! In between, we are having lunch at our rehearsal dinner spot. We will also continue to work on getting the house together! Then, Sunday is my birthday! Since I have been so busy and have so much going on, all I want for my birthday is a good, home cooked meal by my parents and some relaxation time...I guess that means I am really getting old, ha! Wearing: I love love love this Bathing Suit!! I really just love this brand of swimwear. However, I do find some of their pieces a bit skimpy in the bottoms but this Bathing Suit really isn't at all. I would suggest sizing up. I typically wear a small on top and a small or medium on the bottom and I got mediums in both and they fit perfectly! I should also note that this suit is super high quality. The fabric is really thick and also lined so you will definitely be able to wear this for several seasons! Eating: One night for dinner, we had Jamaican jerk chicken and it was delicious! Drinking: I've been sipping on rum punch all week- I'm typically not a 'sweet' cocktail gal, but this was so delicious and refreshing after a hot day of shooting! 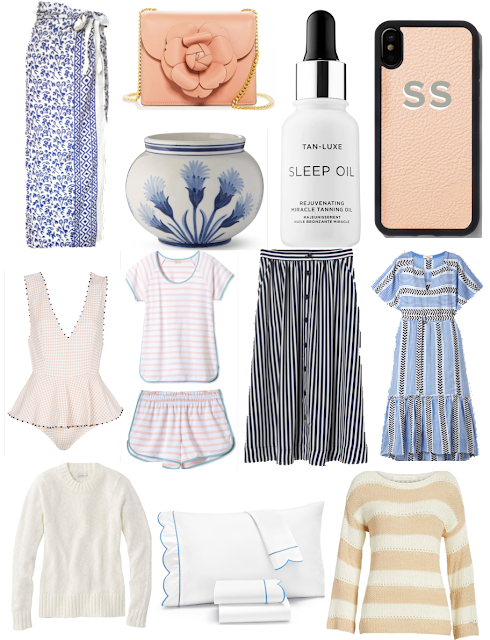 Sale-ing: As you all probably know, there is a big Shopbop sale going on right now! I posted about this sale back in February so you can see alllll of my favorites there. Most are still in stock and all included in the sale! 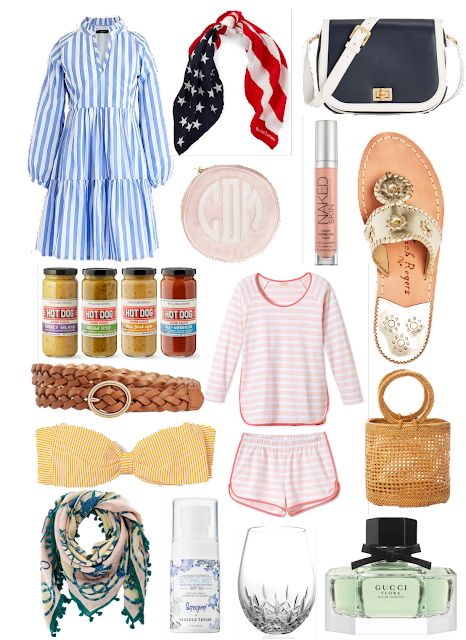 My biggest recommended items to pick up are: Cashmere TravelWrap, Varina Flats, Bow Handbag, Straw Bag, Pajamas, Leggings, Silk Sleep Mask, Bathing Suit, ultraboost sneakers. Scroll through the widget above to see more of my favorites. Watching: My girlfriends told me to watch The Act on Hulu. It's about Dede and Gypsy Blanchard. I had watched the 'Mommy Dead and Dearest' documentary and it was so beyond creepy. This Hulu series is based on the entire story and it is so crazy. I definitely recommend it! 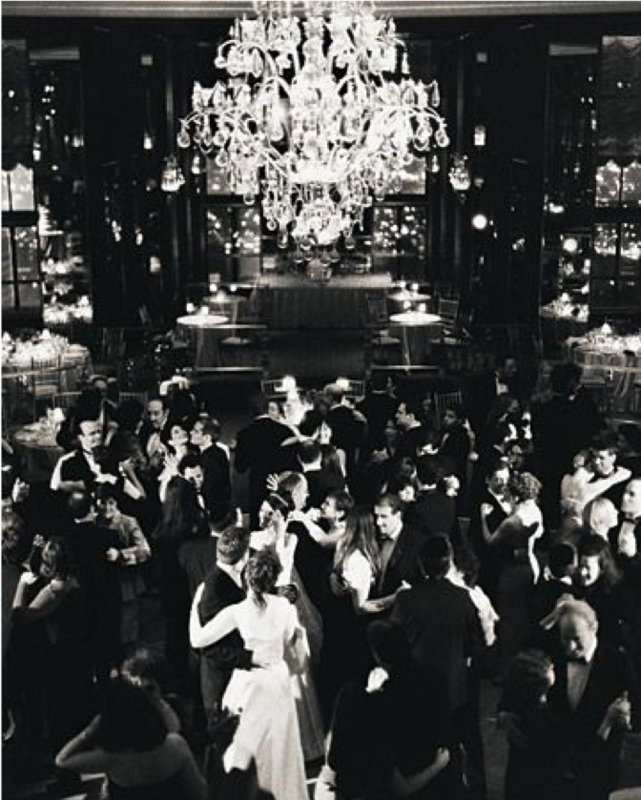 Listening: Did you all see yesterday's Wedding Wednesday post about our band and the type of music I want to be played at our wedding! Wanting: There has not been much on my want list this week because I haven't had time to be on the computer! Good for my wallet, ha! Loving: Right now, I've been browsing patio furniture. We don't have a huge amount of patio space but enough for some chairs or a small couch and a table of some sort. Any recommendations of quality brands that are reasonably priced, let me know! I really love this set because it is modular so I can switch it up if guests were to come over (also super inexpensive)! Quoting: 'Do what you have to until you can do what you want to.' // See more of my favorites, here. I know I'm probably in the rarity in that I love to clean and organize. It's calming and I just love the instant gratification that comes from it. I know some of you feel this way, too, because I get a lot of requests to share cleaning tips, especially after I shared this post! In the spirit of spring cleaning, I thought I would share a list of things that you may not have on your spring cleaning list but should! Garbage Cans and Bins// It's kind of weird to say that you should be cleaning something that you use to hold trash, but it kind of makes sense. Either that or toss them and get new every so often. Polish Silver// This is one that I do often! I use my silverware every day and usually, that helps it from tarnishing as quickly as other silver that just sits out or sits in storage, but I finally caved last week and polished my silverware. It takes a lot of time and elbow grease but shines so beautifully when you are done! Baseboards and Moulding// I actually do this pretty often. It's amazing how much dust can cling to these areas! I just use a microfiber cloth and run it along the areas but if there are any stubborn spots, I use a Magic Eraser. Sofa Cushion Covers// Most upholstered sofa cushion covers can be removed and washed. Make sure you read the cleaning instructions beforehand. I pop mine in with a bit of oxy clean and they come out looking good as new! If you see your sofa cushions starting to sag or become less perky than you would typically like, you can also give them a refresh by buying some stuffing (Amazon, Michael's, etc.) and stuffing them to look new again! Pillows and Duvet// You may wash your pillowcases and duvet covers often, but how often do you actually wash your duvet and pillows?! I wash mine about once a month and wash everything else (shams, coverlet, duvet cover, mattress pad) weekly (my pillowcases sheets twice a week). Refrigerator// This is my least favorite task. You should take every single thing out of your refrigerator and give it a good scrub down. You can do this in the freezer, too! I just ordered these to keep my refrigerator and freezer smelling fresh- hopeful that they work even better than baking soda! Clean Sneakers// I don't know about you but I love and totally live in my sneakers. They get so much wear. Because of this, they get grungy pretty quickly. Somehow, I always forget about caring for them. I use the spring season as a reminder to clean my sneakers- usually, that entails just popping them into the wash but sometimes they need a good scrub/soak with oxi clean! This is soooo satisfying after it is done! Dry Cleaners// Bring all of your winter coats that you have stopped wearing to the dry cleaner so they can clean them up. That way, they will be fresh in the back of your closet and when you go to pull them out on a cold fall day, you'll be glad to see that they are nice and clean! This will also help keep them in nicer shape for longer! Yesterday was Brooks Brothers 201 anniversary! They gifted me a few of their timeless pieces and I'm styling them today because they make so many incredible wear-to-work pieces. A Trench Coat is an essential wardrobe staple for pretty much any woman, regardless of your style or profession. 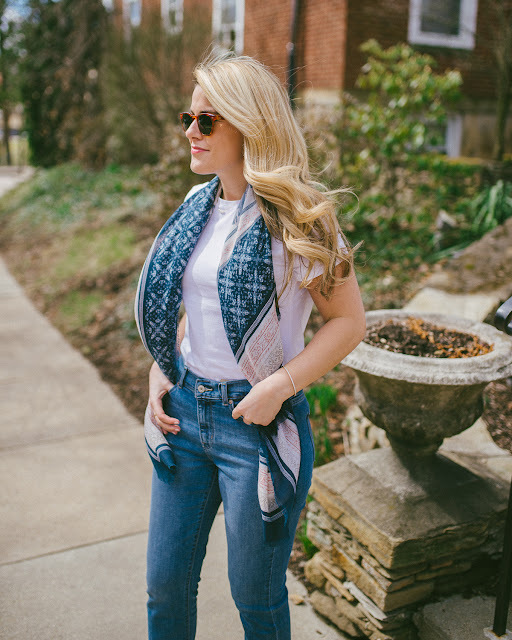 It can be dressed up or dressed down and is the perfect weight for spring/summer/fall. It just looks so polished. 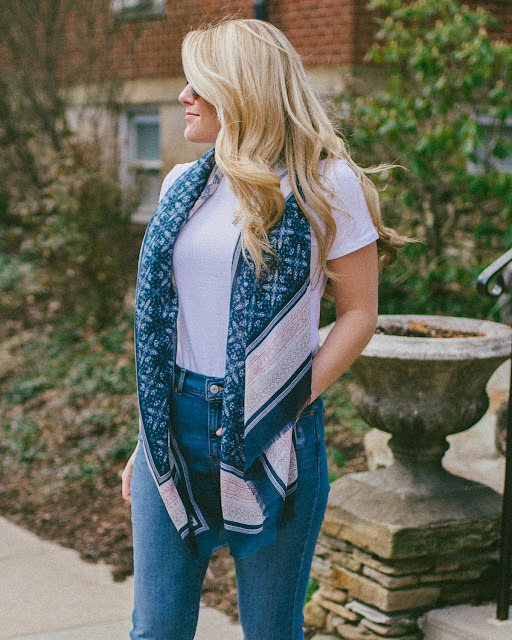 This is one of those types of pieces that are worth splurging on. You want to get something really high quality that you will have for years to come. 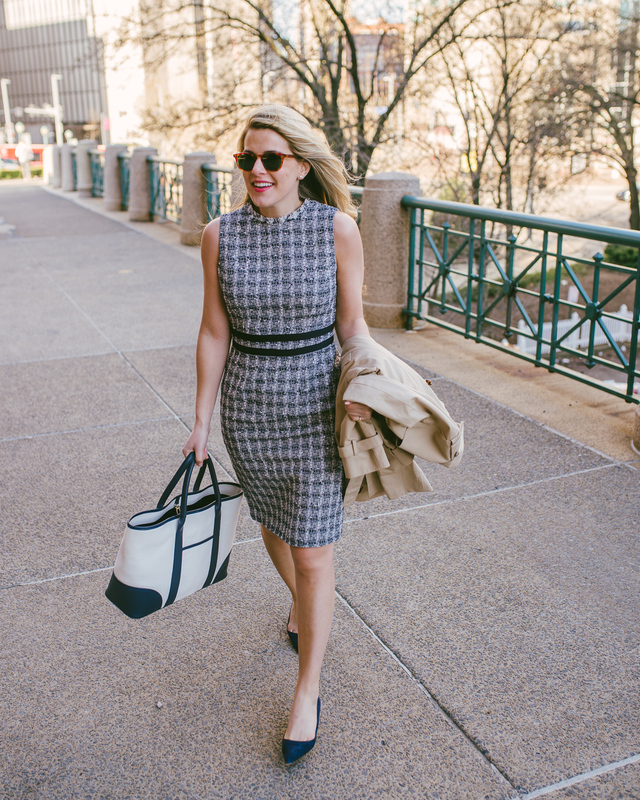 One of my biggest recommendations for women who are looking for wear-to-work pieces if they work in a conservative office is the classic sheath dress. You can find this style of dress pretty much anywhere and everywhere. 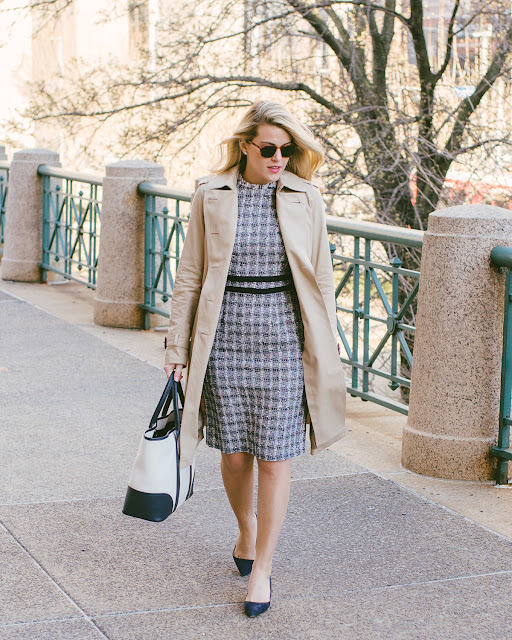 I personally love it most in a tweed because it has a very 1960's Jackie O vibe to it. 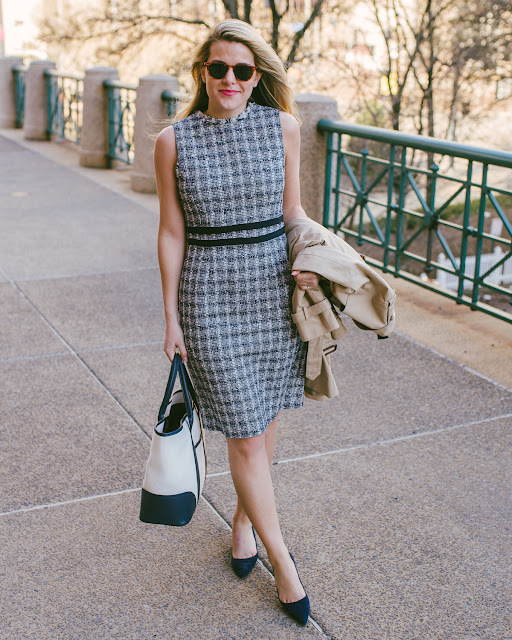 I think a classic sheath is very sophisticated so if you are a young 20-something and newer to the working world, I would definitely suggest something like this because it will make you feel really good and confident! I shared these heels in this post. They are so comfortable! Seriously, you could work a full day with them on and be totally comfortable. The heel height is modest but still flattering, too! In Pittsburgh, it still feels a bit like winter which is not news. April can be a toss-up in terms of weather. I will say, we do tend to get some more sunny days and 60-degree temps which are wonderful. But during the weird, in-between weather, I never really know what to wear... especially because it's usually cold in the mornings and warmer in the afternoons. 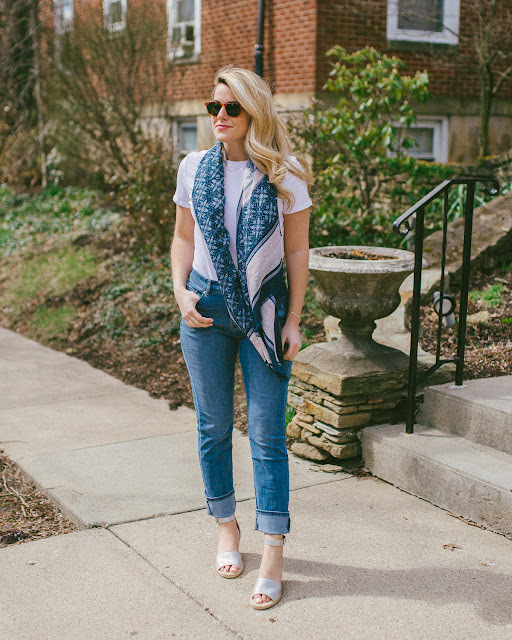 Enter this simple outfit: a Scarf, simple Tee, Jeans, and cute Wedge Espadrilles. It's a super simple outfit and the scarf dresses it up and adds a layer of warmth and the wedges dress it up a little, too, while adding in the spring element! 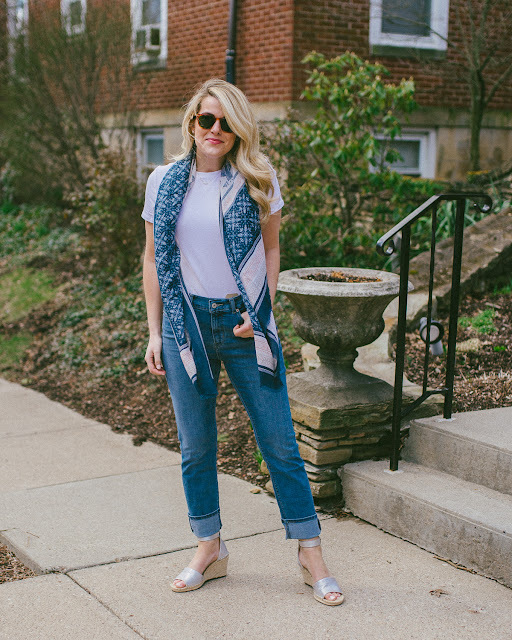 One of my favorite combos is a white tee and a scarf, it's SO simple and classic and anyone at any age can wear the look. I actually got these jeans after reading/researching Levi's. They have made a HUGE comeback and just went public (this is a good article to check out). So, I was intrigued and decided to order a pair! The denim industry is actually making a huge comeback. 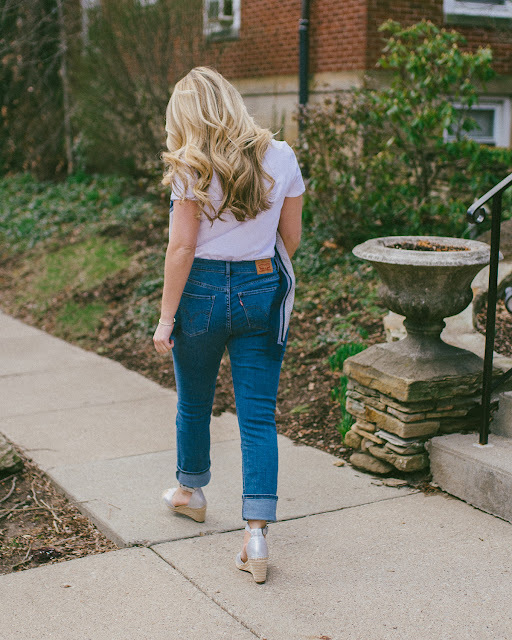 For a while, it was a little stagnant thanks to the athleisure trend, but casual denim is making its way back again. I'm really into learning about these types of things because in the past few years, I've gotten really into investing so keeping myself informed is something I do daily! I also learned that Walmart is upping its online presence. Needless to say, I LOVE this pair of denim. It's a medium wash and super simple. They are comfortable and fit wonderfully. The best part is that they are high quality but at a great price point. They run true to size. I'm eyeing these as the next pair to add to my collection. 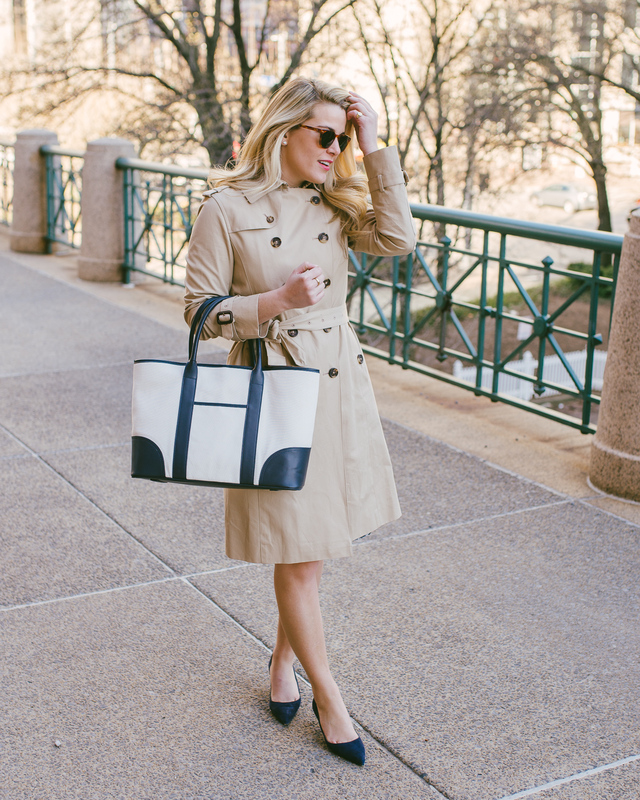 Did you know that they carry pieces from Lord and Taylor? Seriously. These wedges are by Vince Camuto, a brand I already know and love, are available at Walmart! Thank you to Walmart for sponsoring this post. As always all opinions are my own. What. A. Week. Not really ready for the weekend because it is going to entirely revolve around moving things to the new house, starting to put things together, etc. So. Much. Work. We have movers coming towards the end of April, but until then, we're on our own. So thankful for my parents who are helping SO much. At least this past weekend I moved the kitchen and we painted the garage. The painting of the garage was one of those most arduous tasks I have ever done. It took so much time and was so boring. Never painting again, ha! But, I will say, now that the garage is painted, I am very pleased! Monday, I had to drive 3 hours to Buffalo, NY and back to get my passport- it's a long story, but I'm headed to Jamaica on Monday for a photo shoot with a favorite brand so I am very excited! Between moving this weekend, traveling/Jamaica work trip, and then the following weekend I have several dress appointments and it is my birthday, on top of regular work/chores, I'm going to need a very long nap! All fun and exciting things, but exhaustion is setting in just think about all of it! Wearing: Newly in love with this navy and white Gingham Dress. It's truly a simple, timeless piece that you can wear for a lot of occasions. What I love most about this style of dress is that you can easily wear this out to run errands with simple flat sandals, but you can also add a dressier heeled sandal and wear it out for a nicer dinner or party! I'm thinking a wide brown belt around the waist would look really cute with it, too, or a navy blazer if you work in a more traditional office! Eating: I WISH I was eating this for breakfast. Drinking: The only thing that is in our new fridge right now is a bottle of Veuve Clicquot and you better believe we are popping that open this weekend as a reward for all of the blood sweat and tears in this move, ha! Reading: The best chocolate chip cookie in every state. The Pennsylvania cookie is located in Pittsburgh at Nancy B's! I have never been but now it is on my list to try! 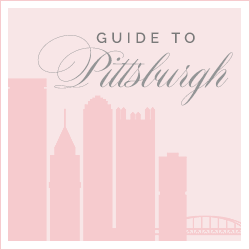 Sale-ing: This sale is for Pittsburghers! Macy's in Pittsburgh is having a shoe sale in-store this Saturday, April 6th. Get one pair of shoes at 30% off and buy two, you get 40% off! You can also take the Great Shoe Quiz on the Macy’s app and you’ll get a $10 gift card to use toward your purchase. There are SO many great pairs included in the sale like all of these amazing neutral sandals. Watching: Have you all watched the Elizabeth Holmes/Theranos documentary on HBO yet?! The story is nuts and now I want to read the book and listen to the podcast. Definitely recommend it- it creeps me out! Loving: Petco is becoming the first retailer that is banning artificial ingredients from pet food and treats. I LOVE this. Wanting: In my house shopping endeavors, I came across so many great pieces from... you'll never believe it... Walmart! They're all super cute and very affordable. Swipe through to see some of the gems that I found! Pittsburgh-ing: Last week I went to Federal Galley and finally had El Lugar! I got the burrito and couldn't even eat half of it, it was so huge! But very delicious and flavorful. I definitely recommend! Traveling: I'm off to Jamaica on Monday for a very exciting trip... stay tuned!! Quoting: See more of my favorites, here. So I'm going to be spending most of my time (and money) shopping for furniture/housewares for the foreseeable future, BUT, that doesn't mean I can't look, right?! 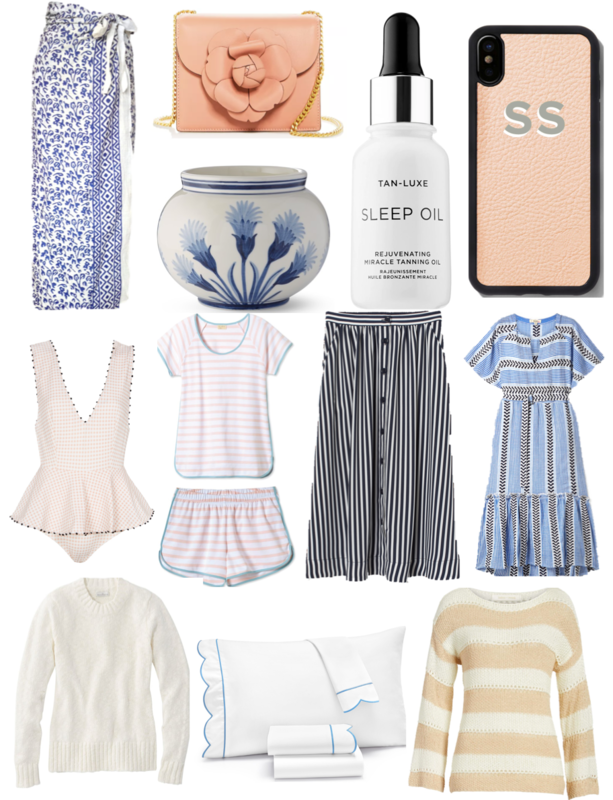 There are so many amazing pieces out right now and I have been eyeing lots of easy breezy pieces, simple wardrobe staples and lots of navy and white, neutrals, and blush pink! Some things of note: these pajamas are my favorite ever and I wish I could wear them all day everyday. I have multiple sets and yet I still want more. This bag has been on my wishlist for a while now. Swoon-worthy. I've been wanting to try this sleep oil. You put it on at night, it is super hydrating and apparently gives you a glowy tan! This scalloped sheet set is a good dupe for much more expensive sheets! 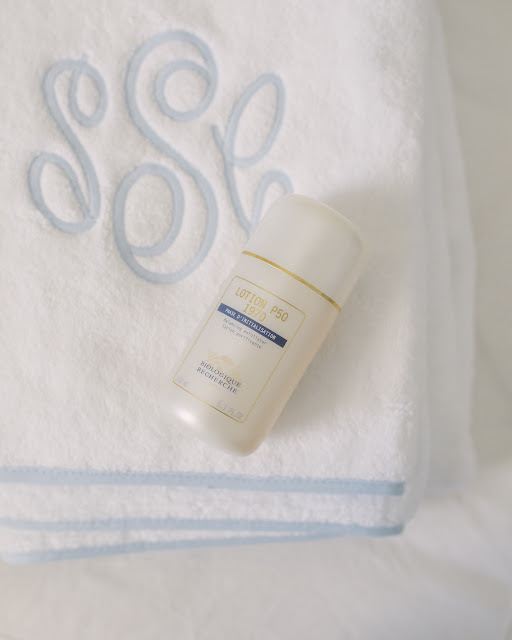 Today I'm chatting about my new found love in Biologique Recherche's P50 Lotion. It's a cult favorite that has been around forever and I finally decided to try it out! Hopefully, this post will answer any questions you might have had! It is a product that is meant to exfoliate the skin. Aka a chemical exfoliator. It evens out your skin tone, gets rid of discoloration, decreases your pore size, clears your skin of acne/blackheads. Does it really do that? Yes. 100% I have noticed all of the above after a month of nightly use. You can get it at some local salons where you would get a facial, but you can also order it online. I ordered from Vicki Morav, what was nice about their site was that you can sign in with your Amazon account. Shipping was fast! You can also order from RescueSpa and Paul Labrecque. You have to have a login to order the products but I'll spare you the effort. It ranges from $28 for a 1.1 oz bottle to $67 for a 5.1 oz bottle and then $101 for the largest 8.4 oz bottle. Although it is called a 'lotion', it's really more of a toner. It has a consistency similar to water. When/how do you apply it? I apply it right after cleansing. I use it every night but if you have sensitive skin, you might want to start out with every other night or every few nights. It burns a little but this is normal and fades after you get used to it. I apply this before my serums/lotions/etc. I put a little on my fingers and rub it around. It is recommended to use a cotton pad but I find that you can easily use your fingers so you are not wasting as much product. It smells horrible, like rotten pickles, but oddly enough, I've found that the worse a product smells, the better it works (ahem, Skinceuticals CE Ferulic). I prefer to use it nightly, although you can use it twice a day (morning and night). Since I am using the strongest version, I find that I don't need to use it twice a day and now that I have achieved great results, I might switch to using it every other night. I also use it nightly because it makes my skin a bit red (normal). Can you use your other skincare products, too? Yep. You can even us in conjunction with retinol. Again, everyone is different and a dermatologist can better help find a regimen that works for you! My biggest tip is that any time you are using any type of chemical exfoliant, use a good sunscreen. Every. Single. Day. No excuses. What are the different formulas and which one do you use? There are six different formulas of the Biologique Recherche Lotion. Each is formulated for different skin types. I use P50 1970. If you are unsure as to which you should use, this is where going to your local spa could really be of help! P50 1970 is what I use. Note that the P50 1970 is not to be used while pregnant. This contains phenol which is an acid and is somewhat controversial. Do your own research and consult your doctor/dermatologist/aesthetician before using any new product! I asked my dermatologist if this was OK to use on my skin and she was perfectly OK with it! I use this because my skin can stand it. You might want to start off with this and once you see results, switch over to a less intense version! The other versions are P50 New Formula, P50V 1970, P50 V New Formula, P50W New Formula, P50 PIGM 400. I swear I saw slight improvements the morning after the first night that I used it. My skin just felt softer and looked clearer. After a week, my skin was still getting used to it and was pretty dry. I had to heavily moisturize. After about 2 weeks I saw very noticeable improvements. My skin was overall smoother, my pores seemed to decrease, any acne scarring, redness, etc. seemed to fade. After a month, I have now dubbed this one of my holy grail products. My skin is so incredibly soft and smooth and clear. I have acne-prone skin and I haven't had a single breakout while using it. For me personally, it is 110% worth it. It is pricey, so try the smallest bottle first, and then decide if you want to upgrade to the larger bottle. This is a new holy grail skincare product for me. I would highly recommend it but I think it is important to make sure you are using the formula that will work best for your skin.